TI = SMA(7)/SMA(65) * 100. So, trend intensity is calculated as the value of the 7 day moving average divided by the 65 day moving average. The 7 day moving average is the average price over a short period (7 days) and will very quickly adapt to current prices. (see the blue line on the chart). The 65 day moving average is the average price over a longer period (65 days) and adapts more slowly. This is an indication over where prices ‘came from’. (see the red line on the chart). A TI value of 120 means that the 7 day moving average is currently 20% above the 65 day moving average. This tells us that prices were moving up quickly in recent history. 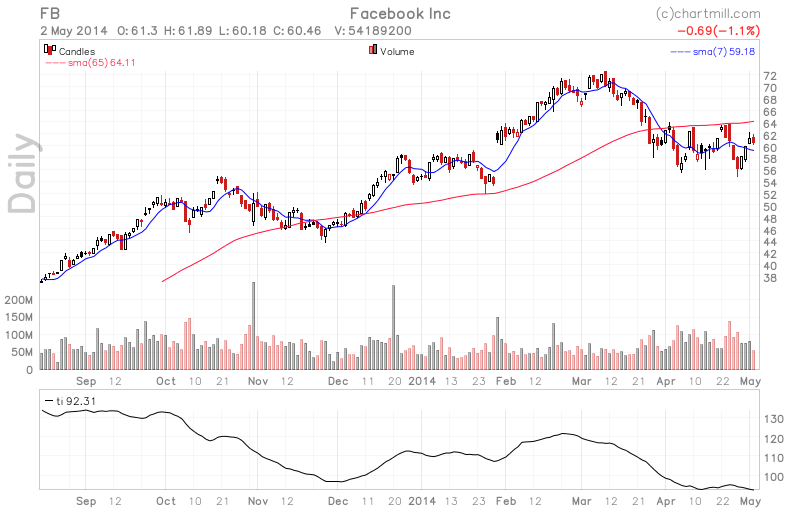 A TI value of 95 tells us that the 7 day moving average is currently 5% below the 65 day moving average. This tells us that prices were moving down in recent history. Trend intensity tells us whether stocks are in an up or downtrend. The chartmill screener allows specifying several trend intensity based filters.